Over 5,000+ coaches and gym owners trust TrueCoach to efficiently create, deliver, and manage their coaching programs. Start your free 14 day trial today! *No credit card required. Cancel any time. TrueCoach is trusted by over 5,000+ professional coaches and gym owners worldwide. We do the math on compliance numbers for every client program you create. You get an overall snapshot or individual details so you can give your attention to clients who need it, and use your coaching skills to move them forward. Your clients can enter their workout data for each workout. So you’ll be able to make quality decisions about their next progression with easy-to-see training data at your fingertips. 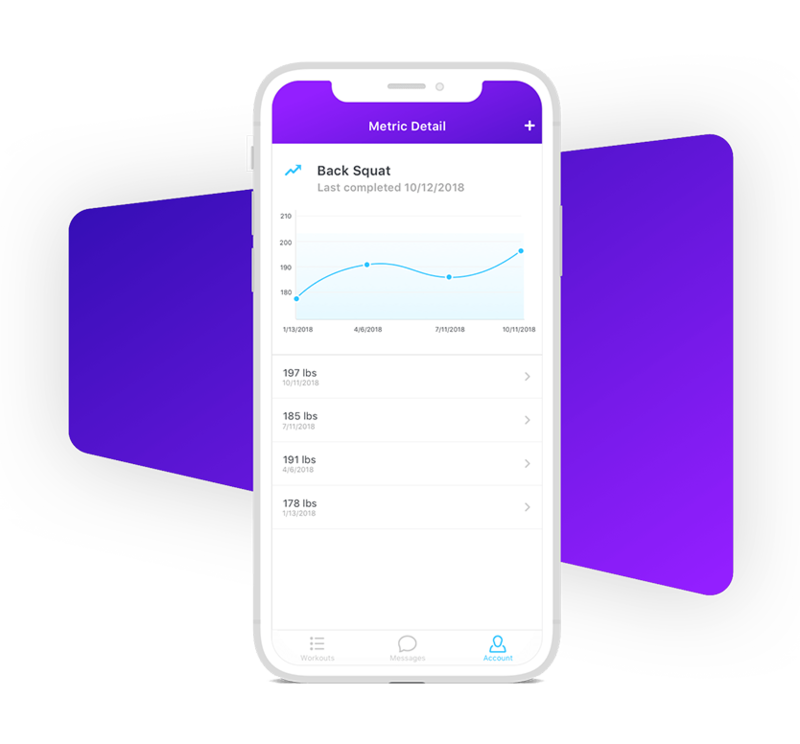 Our workout builder gives you a big-picture view of a month in the past or in advance, so you know what your clients did or need while you're designing. This enables you to fast-track design, creation, and delivery. No more curating workouts on YouTube and linking them to exercises on a spreadsheet. Create your own videos, upload them to TrueCoach, and it’ll auto-link. Or use our library of over 900 pre-loaded strength and conditioning exercise videos. Enter you email below to try TrueCoach completely risk-free for 14 days. No credit card required. Cancel any time. The "glue-it-together" days of spreadsheets, email, YouTube videos, and text messages are in the past. When your client list grows, you shouldn’t be punished with more hours managing more spreadsheets. You can stop the time-sucking admin tasks that pull you away from your clients and start providing a professional, one-to-one, personalized coaching experience that scales your business. 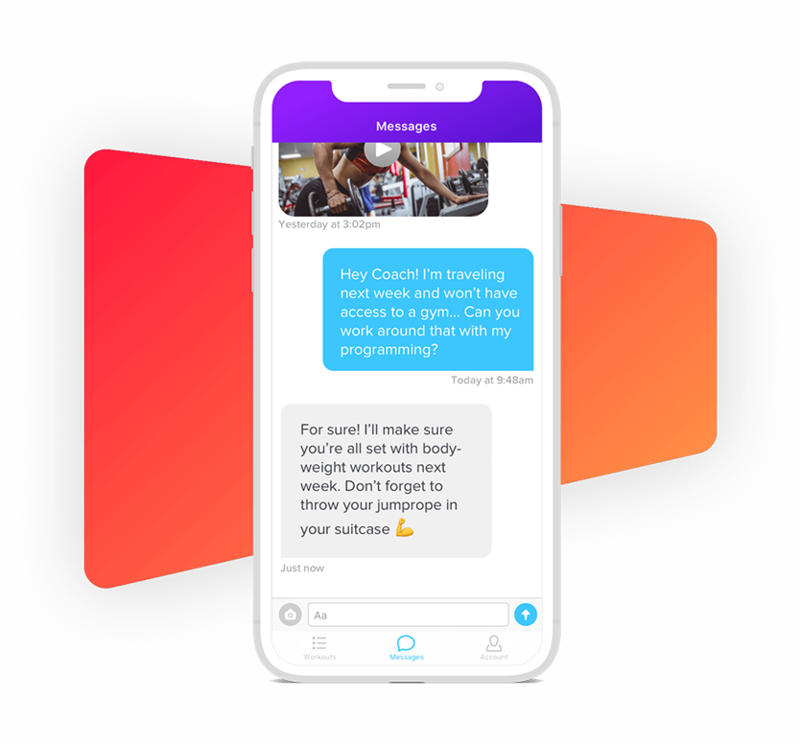 Your clients can quickly log their workouts, review past results, post comments, or ask you questions all from the free TrueCoach mobile app. 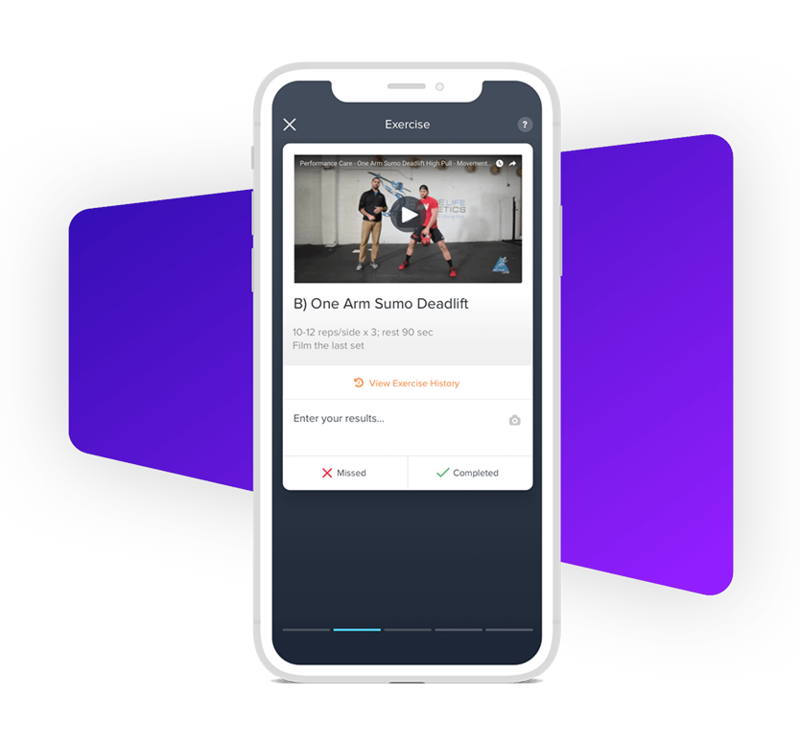 Store all of your coaching videos privately within TrueCoach, or link directly to videos hosted on YouTube or Vimeo, to create your own video library. All coach-to-client communication is kept in one place, so you never lose track of a message or miss an important client conversation. Track exercise history and metrics, so both you and your clients can easily log results and make progress towards specific goals over time. Manage all of your clients and their workouts in one place. We make it easy to add new clients, deliver personalized workout plans, track progress, and stay on top of communication. Automatically notify your clients of upcoming workouts ahead of time. We also remind you when upcoming client workouts are due, so your clients are never left waiting. We make it easy to track exercise history and metrics, so both you and your clients can log results and visualize progress towards specific goals over time. Design entire series of workouts for your clients with TrueCoach Programs. Write your programs once, then customize for each client without having to recreate the program every time. Assign high-level macro goals and measure progress on a per-client basis over time. You can track your clients' macronutrient intake and graph their progress in one place. All TrueCoach plans include support for teams. Invite new coaches to your team, share your exercise library and programs, and scale your coaching business to new levels. Customize your account with your logo and colors. We offer a selection of custom color schemes, making it easy to configure TrueCoach to match your branding. Each of your clients will have a 7, 30, and 90-day compliance rate. These percentages are calculated by the number of exercises completed vs. the number of exercises assigned. On one screen you will quickly know what your clients are doing and where they’re at in a programming cycle, so you can give them what they want before they tell you. 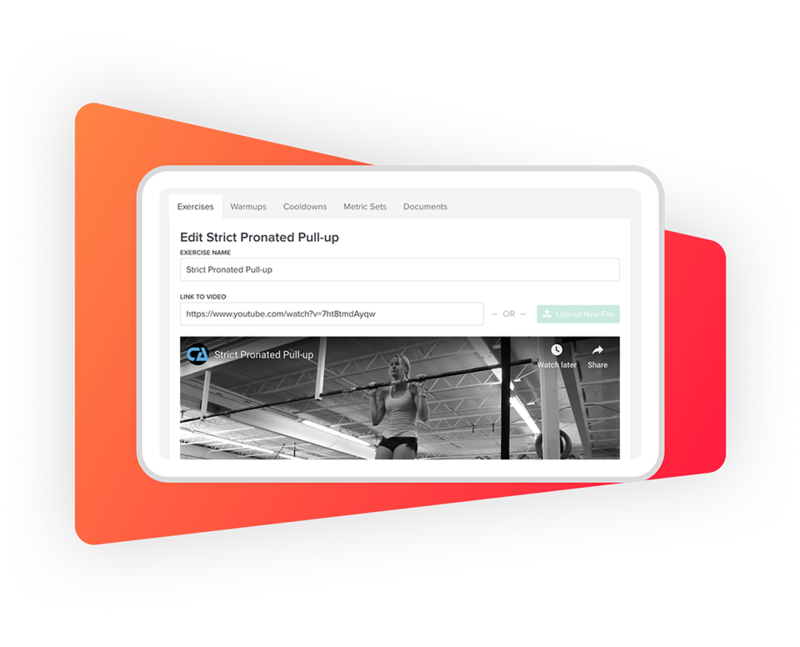 Learn how top coaches and gym owners are using TrueCoach to save time and grow their businesses. "TrueCoach has increased our monthly revenue by over $55,000." "TrueCoach allowed me to make a massive leap in efficiency." "TrueCoach will absolutely help you play a higher level game in fitness." What will you do with all the extra time you save every month? Start experiencing it now with our free 14-day trial. Add your first client on TrueCoach today. Made with ❤️ in Boulder, Colorado. Come work with us. © 2019 TrueCoach. All rights reserved.